On Christmas Eve, Santa is a busy man – taking his (hopefully eco & star-powered) sleigh pole-to-pole and across oceans and continents. If you want to know his exact location, Norad and Google offer ‘Santa tracker sites’ to follow The Claus. Yes, this is a busy man and many families eagerly anticipate his arrival. 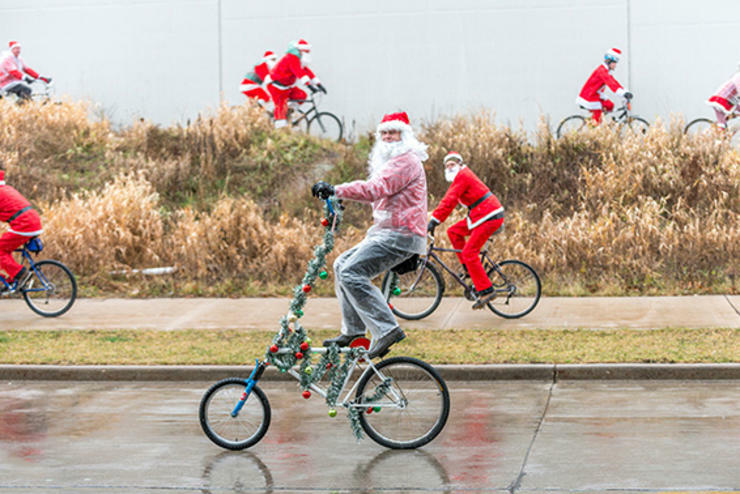 On his off-time though, Santa has been spotted on the golf course, on water skis, and on the bicycle, partaking in the Santa Cycle Rampage in Milwaukee, Wisconsin. As a city cycling enthusiast, this is a tradition I can get behind! 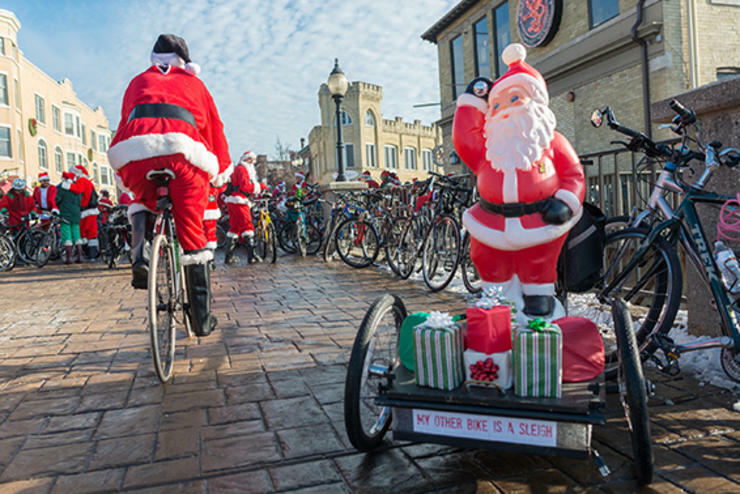 Since 2000, the annual tradition has brought hundreds of red-clad cycling Santas to the streets of Milwaukee to explore the city by bike. First inspired by a similar ride in Chicago, the Milwaukee event was initiated by Dave Schlabowske, promoter and deputy director of the Wisconsin Bike Federation and local bike czar. 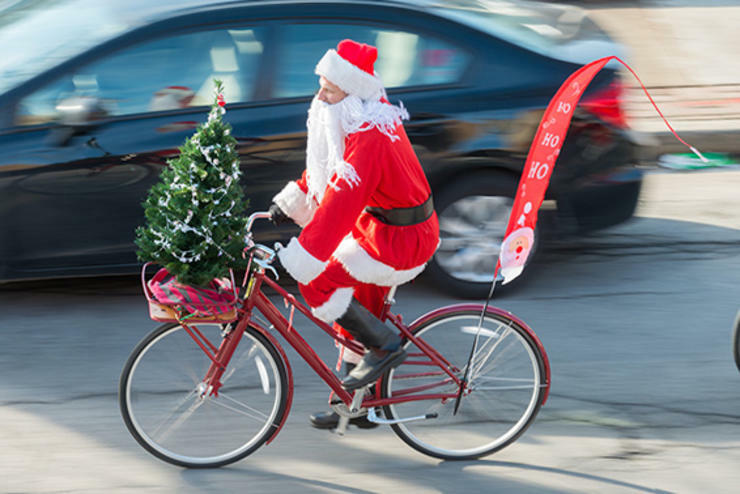 The ride brings together between 50-500 cycling (and Santa) enthusiasts. 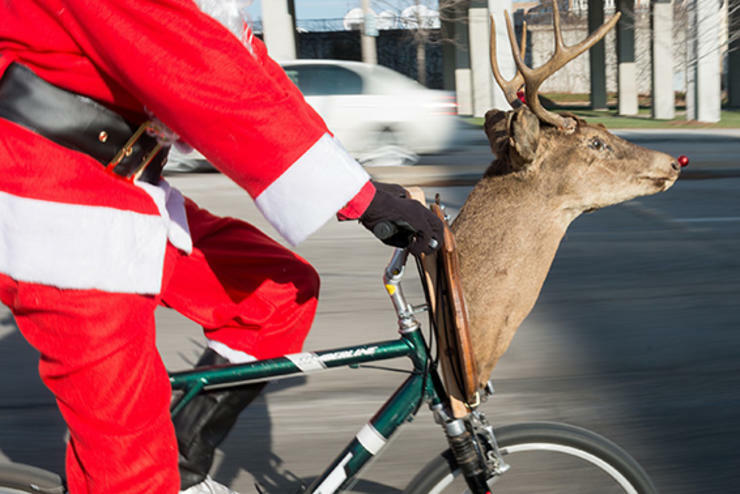 They dress in red, stopping by local businesses along the way, and finish the festive ride at a local pub. Over time, the bike ride has grown in size and became more official, now with sponsors and registration fees (to cover insurance, permits, and official T-shirts). And, in doing so, the Santa cycle has also become more family-friendly, less of just a pub crawl. This year the Santa Cycle Rampage was advertised by local sponsors, and supported by local police who kept the riders safe and together, cycling in a sea of red. 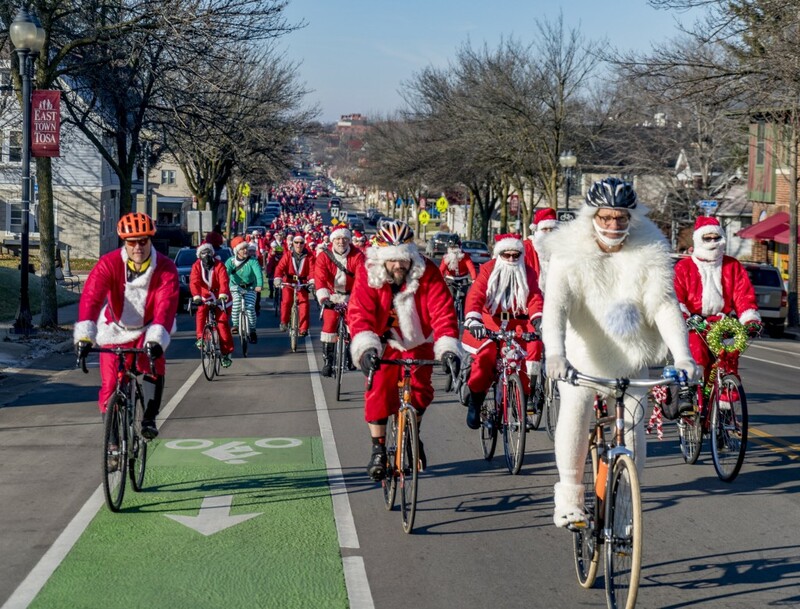 Nearly 2000 cycling Santas hit Milwaukee streets on 5 December, demonstrating the growing love of this tradition – while showing off the city’s improving bike infrastructure. 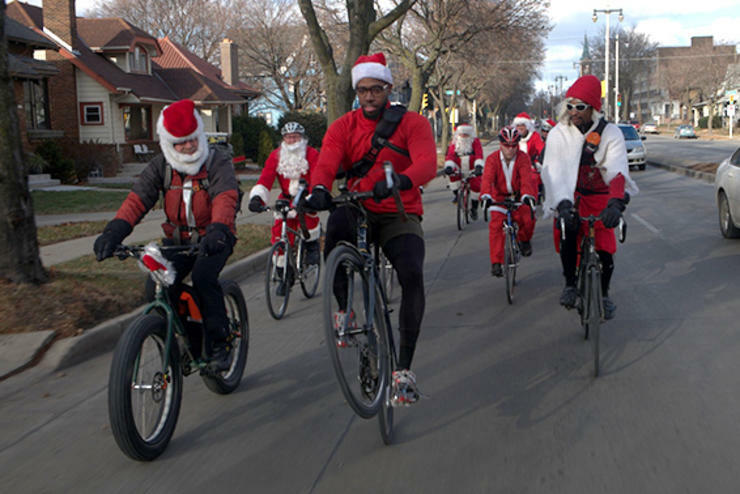 And it’s not just local Milwaukee Santas that join the ride. This year, cyclists came from cities across Wisconsin, as well as US states including Iowa, Illinois, Massachusetts, Michigan and Minnesota. Perhaps a hint that other cities should take up this tradition: welcoming the holiday season, while highlighting a city’s emerging bike paths and cycling infrastructure. 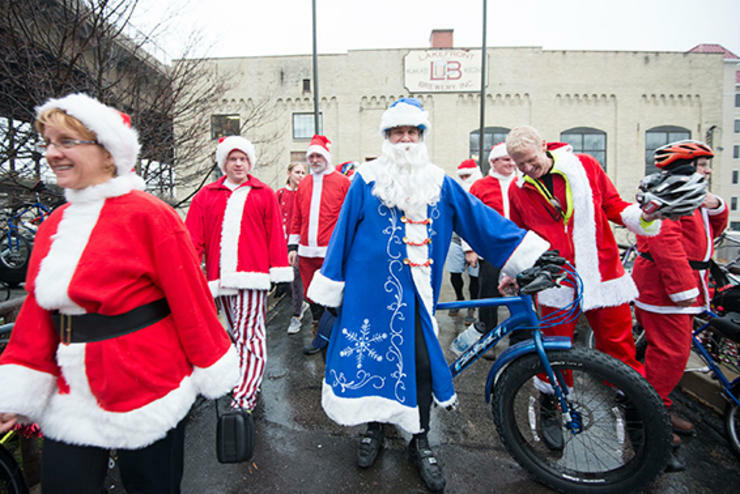 Many of the Milwaukee Santas also took the opportunity to do good deeds in the name of the holiday tradition: a food drive was organized and funds gathered to support World Bicycle Relief. And thanks to event sponsors, nearly US$18,000 was raised to help us make Wisconsin a safer place to ride a bike. Certainly, a #betterbybike win! Go Santa – and Happy Holidays! All photos: Dave Schlabowske. Sources: Bicycling Magazine & Urban Milwaukee.